Wedding catering in the twenty first century is a vast, imaginative terrain but, once you know your theme, style and venue, you can have a lot of fun designing your perfect wedding food. Wedding catering is a true art form and can bring your wedding theme to life in a wonderful way. Once you have decided whether your wedding is outdoor, indoor, formal or informal, you can start deciding on your specific wedding meal, the serving of drinks and other wedding food titbits like hors d'oeuvres and quirky food stations. The options now are as endless as your imagination and the execution ability of your chosen caterer. Your guests may have dietary considerations and you will need a caterer with the flexibility and ability to accommodate the Kosher, gluten-free, sugar-free, lactose-free,vegan, vegetarian among many others. 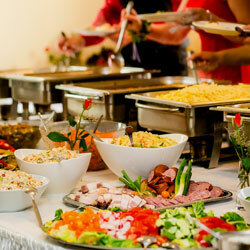 The challenge of providing a meal which includes everyone and is a source of pleasure to all your guests is one your caterer is able to meet with confidence and creativity.With careful planning and a discreet note on your wedding invitation’s RSVP regarding meal choices or dietary considerations, your wedding meals will run smoothly. Many folk hire in a personal chef. Some want restaurant catering where your guests are treated as if they are in a restaurant with full waiting service. Family sit-down affairs are popular but, if most of your guests are friends, you may want to have a more informal meal such as a barbecue or wedding buffet. If you are bringing in a caterer to your venue, does the venue have the facilities to provide for the preparation or will a catering trailer be needed? If the venue is providing the meal, how customized can you make it? If you and your other half are from different cultures or traditions, choose how you will accommodate these. Kosher, Pakistani, Gujarati, Italian, French, European, Asian, Latin American, deep South, Afro-Caribbean, Polish, Nigerian...your decision on the cuisine served will be seen by many as a stamp of the dominant culture in the relationship so choose wisely. If you have a really creative, considerate chef, maybe you could mix it up! The way you time the delivery of your food is another element of the catering for your wedding day. If your guests are travelling miles and the wedding doesn't start til early afternoon, you may wish to provide hors d'oeuvres or food stations pre-ceremony. If your wedding reception party is likely to go on into the early hours of the next day, you may wish to get in a food truck - a taco truck after several hours of drinking and dancing is always welcome! And don't forget the bar. Does your venue has a drinks license or do you need to get one? The drinks can be served as part of the whole wedding invitation or are you prepared to foot the bill for an open bar? Some couples provide some served wedding drinks but then the bar requires guests to pay for additional drinks themselves. Who will be in charge of stocking the bar? If you are teetotal, how will you accommodate guests who do like to drink while ensuring they don't ruin your day? Many weddings also provide a coffee and tea bar for refreshment and rejuvenation of flagging guests. Now the real fun begins: tasting and sampling a range of different vendors’ food prior to making your decision. Don’t go for the first barbecue specialist you find; no matter how time-constrained you are, scout around. Eat. Enjoy. Discriminate. Talk about the how, what, where, when and why. Is the sourcing of the produce important to you? Does your caterer use organic or locally grown produce? On the day, you need to know your food will be fresh, at the right temperature (the hot meals should be hot, the frozen dessert not melting, the wine chilled) and delicious. There will be no room for fixing errors when you are in full-blown wedding mode. Go with a caterer who has done his/her homework, has a thorough reputation proven to deliver and is dedicated to meeting your catering demands and dreams. A wedding meal is a big affair; you are hosting a party for all the people dearest to you on the most special day of your lives so far. If you have bands, musicians or other professionals at your wedding, allow for a non-guest meal to be provided which won’t cost the same but still amply refresh them. Decide on the drinks policy too. Elegance need not be limited to formal, sit-down dinners. You can have simple, elegant informal meals too. If you want a fun element or to take your guests by surprise, include a cookies and milk station or a dipping donut stand. Just ensure it ties in with your theme and personalities. With foresight, planning and a caterer and waiting staff you can trust, everything is possible. Enjoy your dream meal! Wedding catering in the twenty first century is a vast, imaginative terrain but, once you know your theme, style and venue, you can have a lot of fun designing your perfect wedding food.